Follow these tips — or create your own. * Plan all your weekly to­do’s ahead to reduce unnecessary stress. * Get the amount of sleep your body needs to feel replenished. The number of hours is unique to you. Experiment with your optimal amount. * Eat food that nourishes your body. Make 50% of your plate raw and colorful. * Drink plenty of water. Dehydration can be mistaken for hunger. * Move your body. The fastest way to change your mood is to move your body! * Create space in your day to breathe and connect. Take 15 minutes without interruption to just breathe and check in with yourself. * Spend time with loved ones. Research shows that cultures with a strong sense of community are happier and healthier. rituals! Your feedback might inspire someone to make a healthy change! Love you! Be you! Radiate you! "Hey Dani, Can I Open Early?" If you have taken any of my classes, you may know that I often say that yoga is way more than a work out or a stretch. Your practice dives far deeper than any pair of LuLu's (no matter how cute or confidence boosting) could take you. In order to assist my classes, I love adding quotes or basing certain classes off a specific playlist of music I make to help flow your body and open your mind. But maybe what you really need to know, is that yoga is a practice. It will never, ever, ever be perfect. While I have yogis who compliment my teaching style, my music, and my "yoga voice", you all must know something about me...it's top secret... I am only a human. I have days where waking up does not sound pleasing, where opening the studio in 93 degrees to teach hot yoga sounds less inviting than jumping in a pool, and where my past creeps into my mind way more than it needs to be there. There are days where all I want to do is be sarcastic, and other days where I am holding back tears. Pretty hypocritical of me to be telling my students to open up and to stay present, when sometimes all I can think of is how I could have done something better. But guess what is always there for me? My mat, your mat, will NEVER, ask you to come into this sacred space as anyone else but whoever you are that day. Maybe you're happy, tired, or ready for a great workout! I often find myself sending this text to Dani (the YB owner), "Hey Dani, can I come open early?" To which she almost immediately replies, "Of course! Go!!". I lock myself in the studio, unroll my mat or a measure out a hammock, and 95% of the time I plop down crying for a good 20 minutes. Friends, we are beautifully imperfect beings. Life was not meant to be simple and neither is every single yoga posture you'll face on your mat. Nonetheless, I urge you to come to your mat willing to move your body, trusting that yoga will always accept you, and knowing that whatever emotion may happen (laughing, tears) will only be accepted in the studio. We are given our trials and unique journeys in this life to show others how we moved through them and to help others through theirs. Your mat can be a powerful tool. My mat is a place of peace, safety, and home. What does your mat mean for you? Waco friends and visitors, the wait is over—you’re chance to experience the latest fitness trend is finally here..yep..right here in Waco! Take your yoga practice to greater heights with aerial fitness—a yoga/aerial arts based workout blended with strength, cardio, and core training for full-body firming that’s fun and fitness boosting. Using cirque du soleil quality fabric that drapes from the ceiling, you'll rediscover all the traditional poses and work every muscle while your body weight is being fully or partially supported. The hammock holds your body in perfect alignment allowing you to experience how each pose should really feel, which makes it a great compliment for your on­-the-­mat practice. The antigravity, no ­impact workout will increase your range of motion, enhance your coordination, expand your flexibility, and lengthen your spine. Classes are an hour long, accompanied by upbeat music, and led by energetic instructors who will guide you every step of the way. No skills required! This is a first for aerial yoga in our community so we all get to be beginners together! Our New-Student Package is $35 and it includes one beginner class and one intermediate class. In the beginner class you'll learn all the basics of aerial, work on some aerial strength, and have lots of fun! After you have completed your beginner class, you will be eligible to sign up for an intermediate level class. These classes continue to build on the aerial basics and will introduce more challenging poses. Build strength as well as confidence, get out there and try something new! Book lovers, June is here and that means binge-reading season has begun! Check out our list of inspirational must-reads on spiritual guidance, love, happiness, pleasure, women’s health, parenting, personal fulfillment and so much more. 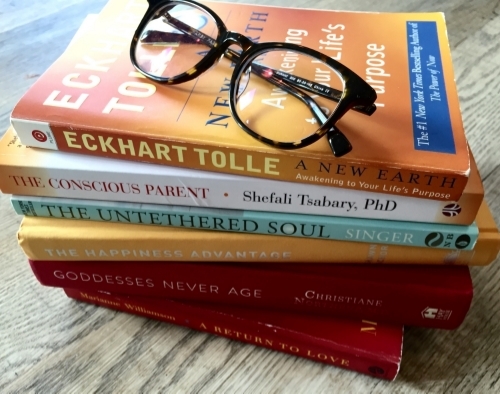 Life-changing, paradigm shifting, feel-good books that will awaken your best self. If you find these helpful, please spread the word, share with your book loving friends on Instagram and be sure to tag @theyogabar with your thoughts and any other good reads on your list this summer! Dessert to boost your energy! Yup, you read that right: Dessert bites that are better than chocolate and will have even the ultimate sugar junkie feeling satisfied and energized! No refined sugars, only plant-based goodness and they taste ah-mazing! I discovered this exciting recipe several months ago and have been replenishing ever since. It is a breeze to make and keeping it handy in the fridge will help you avoid junk and the funk you feel when consuming sweets with refined sugars and artificial flavors. The main ingredients are superfoods—medjool dates, nuts (your choice), chia seeds, hemp powder, raw cacao powder, flax seeds, coconut oil, and unsweetened coconut flakes for sprinkling. These contain an abundance of essential vitamins, minerals and antioxidants all wrapped up in one tiny ball of absolute deliciousness. The plant-based protein, fiber and fat will control blood sugar levels, cravings, and leave you feeling energized throughout the day. It is super easy to pack up and take to work for those mid-afternoon snack attacks. I totally understand if you don’t believe that anything can taste better than chocolate but do give this treat a try. It only takes about 10 minutes to prepare. Most of the ingredients are found in your grocery stores health isle. All you need is a blender. Watch Deliciously Ella’s Video: How to Make Energy Bites to see just how quick and easy they are to make.